Margaret Thorpe, IBM Blueworks Live Product Manager, introduces the IBM Redbooks publication "Discovering the Decisions within Your Business Processes using IBM Blueworks Live". 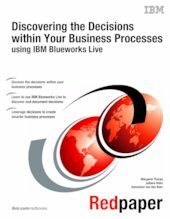 Listen to Margaret Thorpe, one of our IBM Redbooks authors, taking you through a step-by-step tutorial of Decision Discovery with IBM Blueworks Live. In this IBM® Redpaper™ publication, we explore the benefits of identifying and documenting decisions within the context of your business processes. We describe a straightforward approach for doing this by using a business process and decision discovery tool called IBM Blueworks Live™, and we apply these techniques to a fictitious example from the auto insurance industry to help you better understand the concepts.